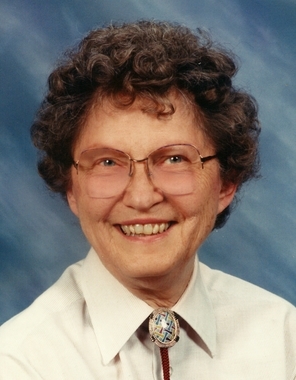 Nona Southard Dvorak, age 96, passed away on April 1, 2019 in Parker, Colorado. Nona was a former longtime resident of Terre Haute and member of Sacred Heart of Jesus Church. She was born near Scottland, Edgar County, Illinois, the daughter of Ray and Nellie Daily Southard. She graduated from Scottland High School in 1940 where she worked briefly in the school office before moving to Terre Haute to work during the war years. She met her late husband, John Dvorak, on a double date with her cousin. She was the mother of six children, all graduates of Terre Haute schools. Nona worked as a nurse's aide at St. Anthony's Hospital from about 1964-1968. She later worked for Nancy's Nutrition Center where she shared her lifelong interest in nutrition. She retired in 1999 and spent her retirement years near children in Illinois, California and Colorado. Nona's hobbies included gardening, sewing, and reading a wide variety of non-fiction subjects. She was an avid viewer of Jeopardy and Wheel of Fortune. Nona always felt that her greatest accomplishment was her children. Her walls were covered with photos of her six children, 10 grandchildren, and 11 great-grandchildren. Nona is survived by her brother, Carl Southard of Casey Illinois; daughters Laura (Bob) Flahart, Angi (Ken) Ishida, Rita (Bob) Rusher, Cheri (Gerry) Gordon; son Dan Dvorak (Wafa Aldiwan); grandchildren Nigel Flahart, Mina (Tamir) Goldstein, Leslie (Dan) Stanley, Mika Ishida (Arsen Avakian), Melody Flahart (Josh Bleeks), Cole (Leah) Rusher, Paul (Leslie) Rusher, Christine (Teo) Mason, Lauren (Kevin) Dinkel, Dana Rusher; and great-grandchildren Kana, Nadav, Logan, Marika, Elise, Brendan, August, Linus, Alik, Evie and Laurel. She is also survived by several nieces and nephews and their families. She was predeceased by her, son David Dvorak, and her husband, John Dvorak.